Remember the adorable bonnet from last week? Here is a smocked sundress to match! Dress measures 13" long by about 13" - 15" wide (depending on your smocking) This dress should fit up to a 12 month old. You can cut it down to fit an infant. are from the Berries Jubilee collection and measure 28" x 17". Step 1: Fold tea towel in half as shown above, then cut. You will now have two pieces. Step 2: Sew both sides together at the side seam, with right sides facing. I wanted my dress to open a little at the bottom of each side so, I measured 3" from the bottom and started sewing from the bottom to the top.﻿ The wonderful thing about sewing with a tea towel is that the inside seam will be clean so you don't have to worry about fraying or serging. 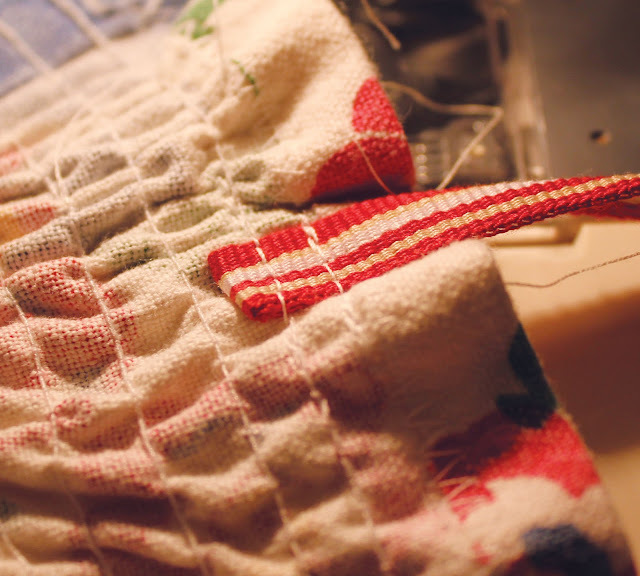 Step 3: Press the side seams open, the ones you just sewed. Then press the top of the dress under about ½". 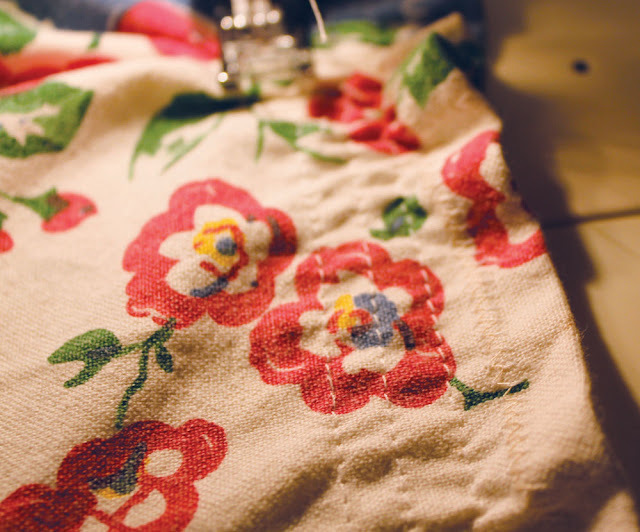 You can press it like we did with the bonnet by pressing under ¼" and then another ½" to make a clean seam. 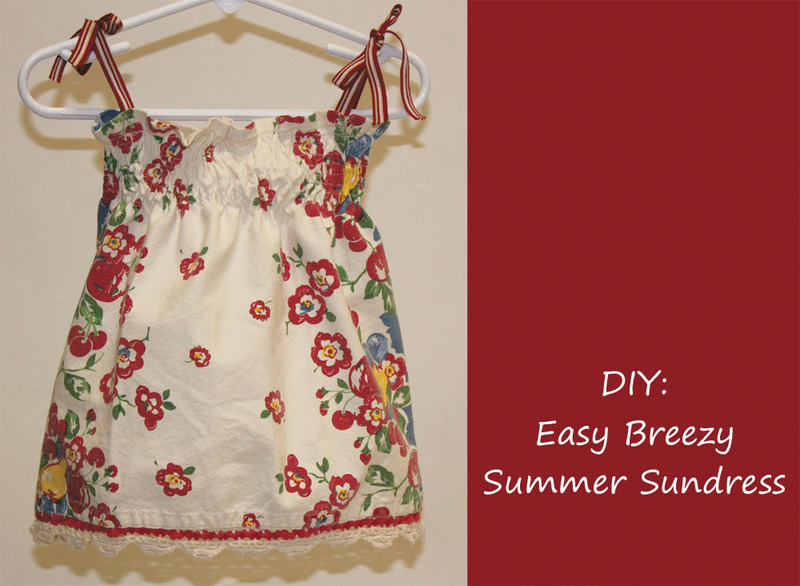 For this tutorial, I just pressed under once and sewed using a zig-zag stitch. Why? No reason, it's a little faster, I guess, and another way to show you how to finish a seam. Step 4: ﻿Wind elastic thread around bobbin. Elastic thread is very easy to use. Just hand wind it around your bobbin, it shouldn't be tight and it shouldn't be loose. Then use it like a regular bobbin thread. Play around with the tensions on your machine to get the stretch you want. This can be tricky and all machines are different. Use regular thread for your top thread. Step 5: Start sewing. I sewed 8 rows, ¼" apart. The more rows you sew, the tighter your shirring will be. ﻿Step 6: Cut 4 strips of ribbon for the ties. I cut mine 11". You can measure the child to get a more accurate measurement. 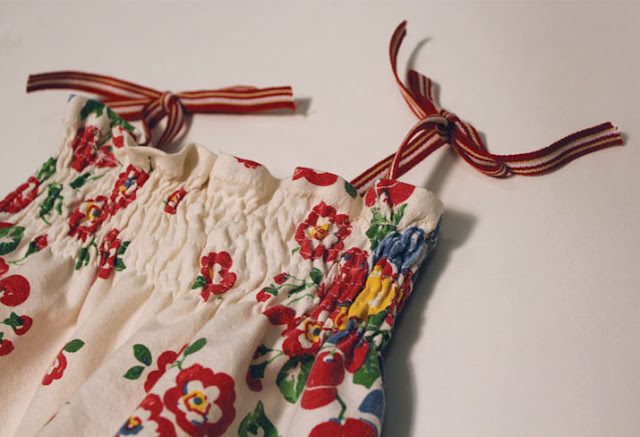 Fold the end under and stitch to the inside of the dress. I stitched mine about 2½" from the side seams. 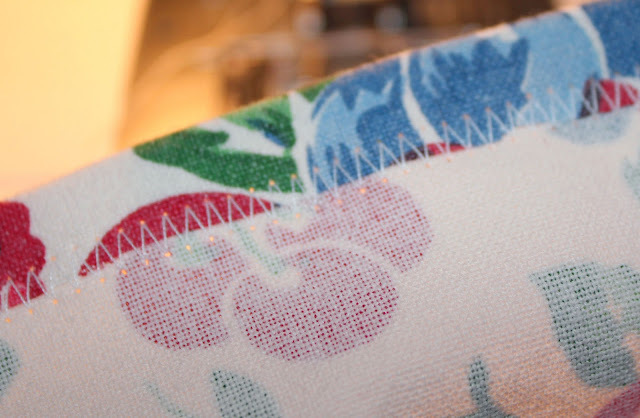 Try to stitch on the stitch line you made previously, this way it won't show through to the front. Just tie the ties and you're done! You've made one little girl very happy in her new dress! This is the cutest thing! I want one...but I want someone to make it for me! :) How adorable would this be as a dress for a little girl? So sweet! Thanks, ladies! If anyone attempts this little number, please let us know. Charlotte, I bet you could make one out of a tablecloth to match your new glasses, after all, every pair of new glasses needs a matching dress! 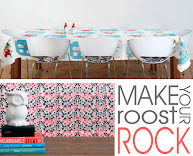 I bet I know where you can find some cool tablecloths...wink. This is so cute! I can't wait to try it! Love your shop and blog!! Just found you on FB. Thanks for a great tutorial! Are you kidding me? I've had this elastic thread in my sewing box forever ... I didn't know you could use it on the machine! I'm making this today!!!! Or, maybe this weekend! Thanks so much for sharing! Oh, wait ... did you use regular thread on top or elastic thread? Thanks everyone for the great comments. I've updated this tutorial and added that: YES, you do use regular thread for the top thread. Thank you for pointing that out! @Carol, there are so many uses for elastic thread. I also like to put it on the hem of a sleeve to give it a little extra flair or you can use it on the side seam of a shirt or skirt to give it a little ruching effect. Play around with it, you never know what you might create!